Change knocks at your door in so many different ways. Sometimes it’s a gentle nudge, a push, or even a shove. But when Kali enters your life, she bangs open and blows down your door. And often, it’s after you’ve received several messages to change, which you may have ignored or simply not known how to put into practice. When she enters your life, your transformation becomes center stage. She strides into your life with a tempestuous stomp of her legs, shakes her unruly mass of thick black hair, the smell of smoke and sandalwood wafts from her earthy powerful figure, and deep, rich laughter gurgles up from her dark belly. She is bold, strikingly beautiful, and powerful. She won’t let you dilly-dally or hesitate or deny or wheedle. She won’t wait for you to finish a project or wash the last dish or complete a conversation. None of the ploys or defenses or resistance you typically use to stall and procrastinate have any effect before her unyielding gaze. She won’t take “no” or “just a moment” for an answer. She washes you away from your sweet, safe, secure shore in a wave of her wisely fierce love. Because it’s your time to transform. 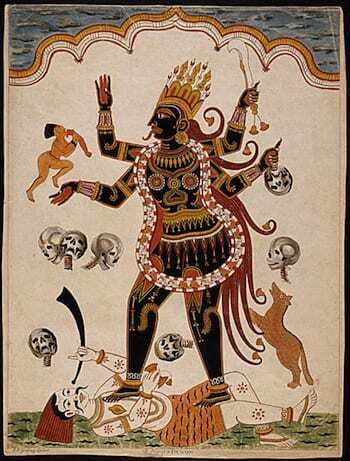 Kali is the Dark Mother who destroys in the service of creation. The third Hindu goddess in the cycle of creation-sustenance-destruction, she destroys what’s served its time, its usefulness, and any cloaked ignorance. But hers is no senseless or merciless destruction. She severs with her sword of infinite compassion, wisdom, and love. She is the great awakener of all that is asleep, stagnant, and as yet undeveloped in you. Black as the night, she is goddess of the dark void, of destruction, the mystery of not knowing, and the slow, quiet search of becoming. Her faces are many: violent, terrible, maternal, furious, tender, destructive, cruel, and indifferent. And she shows you what you need to see when you need to see it. Her lolling tongue feeds on life, prana–your life. She must eat what’s alive so you can give birth to who you will next be. She must also taste what you forbid to yourself. All her destruction is to make space and give life to what’s waiting to transform, come alive, and be born anew in you. Everything must transform—this is a universal law. We get so accustomed to, identify with, and grasp who we are and what we do. We clutch at life to have it stay the same. But to be alive, we must change. Otherwise we’re stagnant, diseased, or dead. It can seem cruel, impersonal, even heartless when your relationship, career, or what matters to you is going so well to have it be torn down or blown away. But there’s a wisdom to her violence: there’s more to who you are. So much more. And she’s going to help you become that. She is here to rebirth you. What is really true for me now? What have I not been listening to? You may find you lose your job, relationships, and often, what you believe and hold as true. It’s her way of guiding you towards your purer truth. 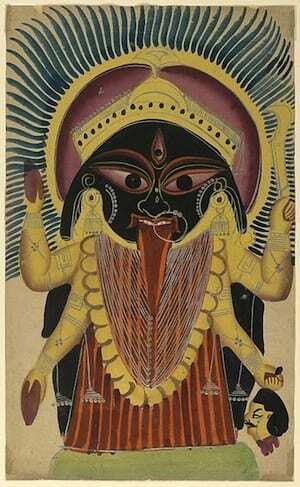 Kali calls you to face what’s taboo, repressed, and denied. Regardless of social, familial, or cultural dharma, she makes you look at everything you’ve closeted away. Because what you forbid to yourself is a life you don’t allow. She forces you to step out of what you know. She forces you to find new ways of being. She makes you look at what you’re most afraid of. She summons the warrior in you who can stare right back at your deepest, darkest fears. And so, she frees you from fear itself. She disrobes you of your pretenses, excuses, denials, defenses, illusions—of any and all falseness. Until you’re able to stand alone in your nakedness and know yourself as you fully are. There, surrounded by her quiet, still darkness, you can finally see and know yourself. There, you find and know all that is true to you and for you. There, you are naked, true, and real. If you’ve been disempowered in your life, as so many have been in overt and subtle ways, Kali rouses your warrior. Bold, fearless, fierce, and rippling with righteous rage, Kali barges right through social norms to tell you it’s okay, good—no, absolutely essential—to be powerful. She draws out your boldness, assertiveness, and rides alongside with you, cheering your power. Most of all, she gives you permission to be angry, powerful, and rise up against everything that’s kept you down, kept you silent, kept you small, kept you “in your place”, kept you going along with what you haven’t wanted to”… (you can keep going). For she’s the most powerful of Goddesses. And she wants you to have, stand in, and live from your incredible power. She awakens you to a new reality. She stretches you to step out of your limited view, perspective, and stance to see the larger whole of who you are and your life. She awakens you to the polarities of the Divine—life and death, creation and destruction, tenderness and cruelty, pain and pleasure, light and dark. And when you can see and hold them, with all the accompanying shock and awe, then you truly enter into the Divine Dance with her. Kali represents the ultimate surrender. She asks you for everything you have—your identity, ego, beliefs, wants, desires. She asks you to let go of everything you hold dear. Only when you’re ready to destroy and let go of all that you are now, can you open and discover who you are more deeply, more truly. When you do, you become even more the precious pearl of who you are. You radiate your divinity even brighter. She gathers you into her arms with the most tender maternal love. And you receive more than you can imagine is possible. In what other ways do you dance with Kali? I’d love for you to share here.